In the last couple of years, I have noticed a disturbing trend in my email inbox: the rise of publisher spam. Less reputable publishers have long spammed librarians to hawk their wares, even though I would posit that so doing actually pushes their reputation further down the scale. Lately, however, I seem to receive more and more unsolicited email from reputable presses, for example the University of North Carolina Press [update: they got the message, see the comments below!]. While these publishers do offer the option to unsubscribe from the list, that they put me on the list in the first place without my consent is a bit irritating. Sure, in the old analog days–which unfortunately persist for some publishers who didn’t get the memo about the 21st century–publishers mailed out catalogs by the ton, even though few librarians I know use them as a selection tool. In my hands, they have always had a half life of about six seconds. Junk mail is annoying, but spam is moreso and has the added dimension of feeling like an invasion of one’s personal space. Given that we have tools to deal with spam, it’s not a good idea for publishers to utilize it. As a Gmail user, I routinely flag any unsolicited offers as spam, even those from legit companies with whom we otherwise do business. I’m sure others do, too. What that means is that their business gets pulled down into the muck, and Google is rather merciless when it comes to responding to users’ assessments of their incoming mail and will gladly enhance their spam filter’s effectiveness by tossing such junk into the spam category. It’s bad business practice to engage in spam, and frankly shows great ignorance on the part of publishers about how academic libraries buy their books. Hi Dale. Unintentional spammer from UNC Press here. It’s a delicate balance to find the ideal audience for our books and not annoy the wrong audience. I’m sorry we got it wrong this time. 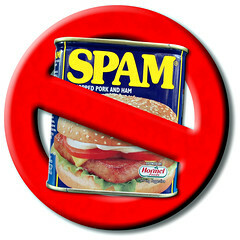 We’re all sensitive to that danger here and really don’t want to become the kind of spammers that annoy us as well! Thanks for calling us out when we needed it. We’re revising our email strategies to focus more on our own opt-in lists, and less on lists from outside sources. Thanks for your comment, Ellen. I debated when writing this post whether to name a specific press, and ultimately chose to do so using the most recent offender from my inbox. Good to see that you clearly have something like a Google alert set up to catch mentions of your name, and react in a positive way when called out. Glad my harsh tone didn’t put you off. It is aimed more squarely at the less reputable “academic” spammers, where one has no option to opt out, and must create filters (or rely on gmail’s) to sort the incoming barrage. I hope that your attention to these matters pays off down the road, and that presses that don’t get the memo suffer for their tone deafness.